I’m an unabashed Google Reader fan. Reader is considered to be a best in class web-based feed reader. But it can be so much more than that. Here are a few ways that I use Reader other than tracking my favorite feeds. Using the “Note in Reader” bookmarklet, I’m able to save any web page and organize it in Reader. Tags keep things tidy and I’m also able to add my own personal notes to remind myself why I saved it in the first place. Because I’ve gathered all of my favorite authors and other sources of content in Reader, the search feature can be really useful. I have a lot of feeds and don’t get around to reading all of the posts. In fact I usually skim the headlines for interesting items and use the “mark all as read” button generously to keep things clean. Using search, I can focus a query on my favorite sources of info rather than the whole web. For instance, I read a lot of tech blogs that post dozens of times a day. If I’m looking for a review on a new product or a commentary on a new website, I’ll use Reader’s search to get the info from sources I trust, and quickly. 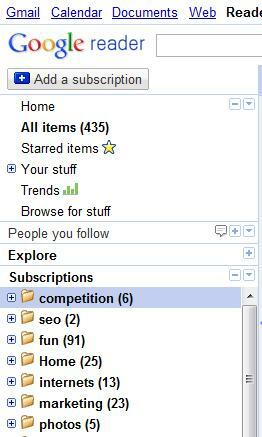 After using a variety of tools to create persistent search feeds, I use Reader to collect and share interesting items. Irrelevant results are a part of persistent searches. Rather than trying to fine tune my queries too far, I add my own human filter to the rough results to make sure I’m keeping only the quality items. Using Reader, I scan the headlines of the items that come through and open the ones that look interesting. If the item passes the my quality check I add a label, which puts it in the ‘keep’ pile. The rest go unlabeled and stay out of the way. The result is an ultra-clean set of persistent search results. And because I’ve labeled them, I can share them with co-workers on a web page (manage subscriptions -> Folders and tags -> view public page), in a ten-foot display format (subscription menu -> View in Reader Play), or as a new RSS feed. For stubborn email users, I can use Feedburner to deliver those items by email too. The team behind Google Reader has made great strides in this area lately. Because Google knows so much about you (which scares some people but doesn’t bother me much) it can make pretty good suggestions about what you’d like to see. Reader’s Explore bar gives you suggested posts and suggested sources of popular stuff related to your interests. If you find that you’re sorting through too much clutter, you can try PostRank for Reader, which further filters suggestions by giving them a popularity score based on other users’ behavior. If you have a lot of feeds or if your feeds post frequently, it can be especially useful. You can also try typing a topic into the ‘Add Subscription” box and find new feeds that way. Add to all this the fact that the regular feed browsing features are amazing too and it’s no wonder I’m in Reader most of my work day.